Here’s the poster for a talk I recently gave at Binghamton University (March 4). It was essentially the same talk I gave at UC San Diego in February, but reorganized & improved in focus and clarity. I hope, at least. It was a great opportunity to fine tune my arguments about the significance of geopolitics and minority politics in understanding queer activism and conservative backlash, and it was lovely meeting the Korean studies faculty and graduate students there. Because flying to Binghamton from Toronto would have taken nearly as long as driving there, I decided to rent a car and drive — 5 hours each way (I’m a slow driver) instead of spending slightly more time going through airport security, taking a short flight, waiting for a connecting flight, etc. It was my first time driving through this stretch of upstate New York, and though the weather wasn’t great and the drive did feel pretty long, the rural landscape was interesting. Even charming at times. The talk itself went well, I thought, and the paper felt more coherent and clearer than before. The audience consisted mostly of undergraduate students taking Asian/Asian American studies courses, and the vast majority of them (about 75 in the lecture hall) were Korean American or international Korean students. As soon as the talk was finished and it was time to ask questions, more than 20 hands enthusiastically shot up, and it stayed that way during the Q&A. Plenty of questions is always good to see, but the questions revealed a dismally uninformed/misinformed and disturbingly homophobic student body. Not everyone, obviously, but quite a lot of the questions were shockingly homophobic. In fact, I hadn’t received questions this bad in a while. I couldn’t tell if the crowd — many self-identified as Korean American and Christian, as it turned out — was especially homophobic or if a few just felt empowered to assert themselves shamelessly in public. What do I mean by homophobic? Here are some questions I received. I thought I handled the questions as well as I could have, and I did honestly enjoy fielding the barrage of wild questions. After all, I have been doing “Queer 101” type talks for over 20 years — since I was an undergrad in the early 90s. After the adrenaline wore off, though, I felt a little sick, sad and exhausted from what I can only describe as a disheartening, dehumanizing experience. I can only hope that they learned something from the talk and Q&A, perhaps even challenged by listening to a real live queer person (me), but I can’t deny that I felt subhuman and dirty, like I was spat on. After all these years, there is still So. Much. Work. To. Do. Whether referred to as ‘LGBTI’ in coalitional terms of identity politics or ‘sexual minority’ to emphasize relations of solidarity among marginalized communities, queer activist movements in South Korea urge expression of non-normative gender and sexual identity and recognition of dissident political subjectivity. Though queer activism has become more legible in the broad and vibrant social movement landscape, it also faces intensified religious and institutional homophobia in the political sphere, most prominently represented by the largely Protestant-led opposition to basic human rights and anti-discrimination policies. 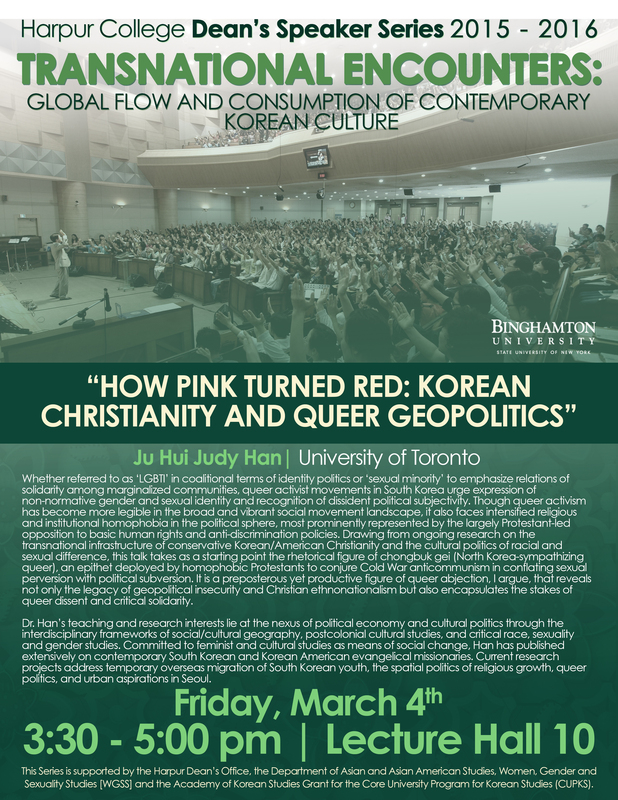 Drawing from ongoing research on the transnational infrastructure of conservative Korean/American Christianity and the cultural politics of racial and sexual difference, this talk takes as a starting point the rhetorical figure of chongbuk gei (종북게이 North Korea-sympathizing queer), an epithet deployed by homophobic Protestants to conjure Cold War anticommunism in conflating sexual perversion with political subversion. It is a preposterous yet productive figure of queer abjection, I argue, that reveals not only the legacy of geopolitical insecurity and Christian ethnonationalism but also encapsulates the stakes of queer dissent and critical solidarity. Dr. Han’s teaching and research interests lie at the nexus of political economy and cultural politics through the interdisciplinary frameworks of social/cultural geography, postcolonial cultural studies, and critical race, sexuality, and gender studies. Committed to feminist and cultural studies as a means of social change, Han has published extensively on contemporary South Korean and Korean American evangelical missionaries. Current research projects address temporary overseas migration of South Korean youth, the spatial politics of religious growth, queer politics, and urban aspirations in Seoul.